Mind Over Mother: That's My Bag! I know, I missed the Weekly Wrap Up, none of you know how my move went, and while the first day of orientation was semi-interesting, I don't think it warrants an entire blog post. 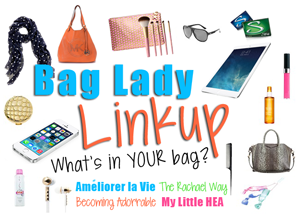 SO, I am linking up with Becca, Heather, Lisa, and Rachael for the Bag Lady Link Up! If you can't tell, I kind of live out of my bags. I try not to carry ones that are TOO huge, otherwise I may get lost in it and never be found again. I also switch between 3 or 4 main bags, depending on what I am wearing. I have 2 black purses, a cognac colored leather tote, and a navy blue tote from Franklin Covey that I love. I also have a bunch of canvas tote bags, a messenger bag from my job, and a Vera Bradley tote that I got at a thrift store for $20. Exhibit A: My bag. Ho-hum. 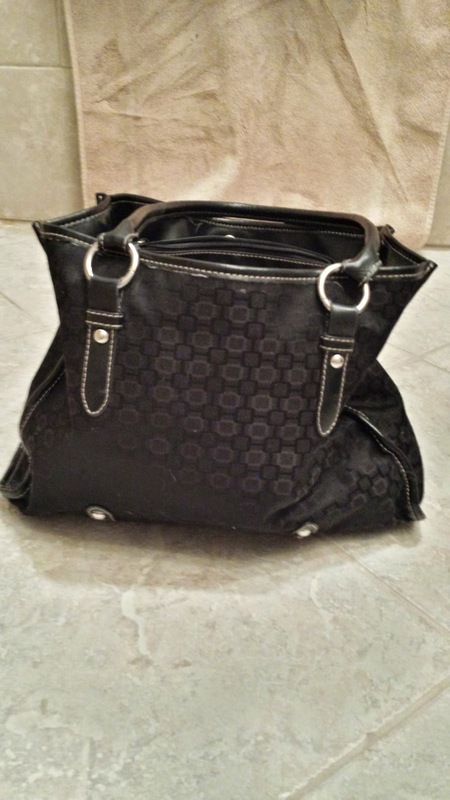 This is a deceptively large bag in which I lose my phone about 900 times a day. I bought it at Kohl's approximately eleventy-billion years ago. I have no idea why it's still alive, and in fact, there's a hole in one of the inner pockets that leads to the mystical space in between the lining of my bag and the bag itself. Once I found 12 screws and nails in there because I had taken down a bunch of frames in our old apartment and threw them into my bag. It was like going to bag-Narnia! 1. ID holder - This was a gift from Constance and I used to keep my med school ID in it... and then my grad school ID... and now it will hold my med school ID again once we get those. 2. Keys - I lose these in my bag about 93 times a day. There's the fob for my car, 2 house keys, a mailbox key, an extra key to Ken's car, a key to my mom's house, and a bunch of discount cards for grocery stores, some library cards, and a swipe card for the gym I don't go to on there as well. 3. 5 blonde bobby pins - I swear, these things multiply in the bottom of my purse. 4. Check book - Yes, I carry my check book. No, I'm not actually a hundred years old. 6. Hand lotion - This was an impulse buy in line at Ulta. It smells like cucumbers and I kind of want to eat it. But I won't, I promise. 7. 3 pens and 2 pencils - Seriously, I don't even know where that yellow pencil came from. 8. Hair clip - This usually lives in my bathroom but it was so hot today that I threw it in my bag in case I needed to get my hair off of my neck. Then I was too stubborn to mess up my blow-out, so I didn't use it. 10. A smaller bag - This pouch is actually from my navy blue bag, but it has important stuff in it, so it travels from bag to bag. More on that later. 11. Wallet - I really need a new one of these because the snap on this one has been broken for ages. It's... where I keep things one would normally keep in a wallet. The end. 12. Drugs - No, not that kind. Tums, papaya tablets (papain is a natural digestive enzyme and it helps calm my stomach), Execedrin Migraine for less-serious migraines, and Fioricet for ice-pick-in-my-eye migraines. Also, there an alcohol swab there (smelling alcohol swabs can help curb nausea... also, you never know when you need to sanitize something, I guess), and a lone Benadryl tablet for those impromptu allergic fiascos. 13. Microfiber cleaning cloth - This is supposed to stay in my car to clean my GPS screen, but I threw it in my bag so I could clean my glasses and my phone, too. Leaving it out and about in my disgusting bag is probably defeating its cleaning purpose, but... oh well. 14. A receipt/tracking info from the post office - Today I mailed a suit that doesn't fit me anymore to a friend I made over Twitter who needs a suit in that particular size and couldn't get one at this time. She is starting law school and was feeling pretty down that she couldn't afford a new suit, so I volunteered to send her one of mine that I'm no longer using. It made my heart smile to make someone's life a little brighter. 15. Cosmetic bag - Holding... cosmetics. More on that later. 16. A quarter - Self explanatory, I hope. 17. Appointment reminder cards - One for my neurologist and one for my rheumatologist. Okay, maybe I am a hundred years old. 18. A PATCO Freedom card - New Jersey has almost no useful public transit to speak of, but you can get to certain places in Philadelphia from certain places in NJ with relatively little chaos (although don't expect to be on time). When I commuted, I reloaded this card weekly to go back and forth via the train. Since then, it's been hanging out in my purse and I use it when I need to go to Philly and don't want to drive. Which is pretty much never, but hey, there's money on there! And I bet you're wondering, "Hey A, what was in those smaller bags?!" I'm going to tell you, you lucky people. 2. Mirrored compact - A gift from my best friend Victoria for being her MOH. It has my name on it! 3. Chapstick - From my dentist's office...? I have no idea why that is in there instead of my Burt's Bees. 4. Clinique High Impact Mascara - I just bought a regular size of this mascara, but I threw the tiny one in my bag in case I needed it. 5. A hair tie - For obvious reasons. 6. More blonde bobby pins - See above. 7. Blush from Ulta - I don't usually wear blush so I have no idea this was in there. All good questions. 8. ELF Concealer and Highlighter - I used to buy $23 concealer because it was awesome. Then I tried this one, which I think is $3 (or less) at Target and it worked just as well. Sold. 9. More drugs - This is my Byetta, an injectable medication that I take to help control my insulin resistance from my PCOS. Yes, I inject myself with drugs once or twice a day. 10. Naked lip gloss - I usually hate lip gloss, but a friend gave this to me and it's quite lovely. 11. Lipstick - In... some shade of brown-neutral. Thrilling. 13. A key - I thought this was our mailbox key. It isn't. I have no idea what it's for. Make something exciting up and tell me in the comments! So that, my friends, is what I carry on a regular old, random day on which I went to orientation for med school and ran some errands. 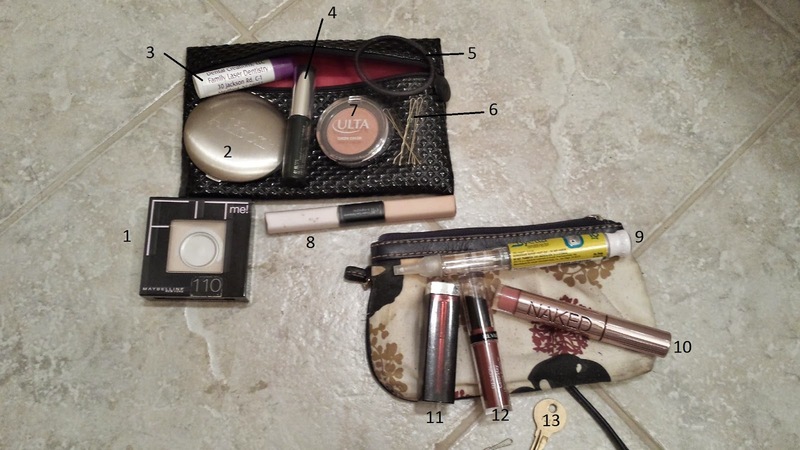 What's in your bag? Anything interesting or fun? Do you also carry bags inside of your bags? 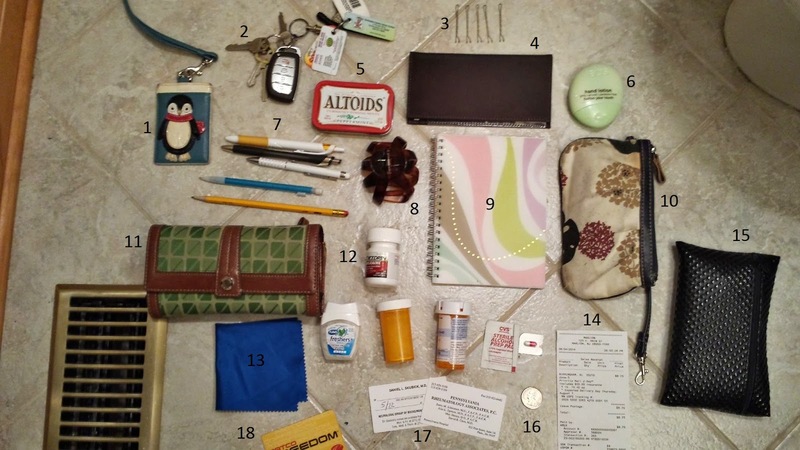 Do you have the same problem that I have with living out of your purse? Let me know! My purse goes inside my everyday bag I take to work, and right now I only have a bag that holds pens. I love that you shared what was in the smaller bags at the end! You have a lot of stuff in your bag, just like me. I love your little notebook - so cute. I love it! Everything has a purpose and a place! :D Thanks for linking up! I was really hoping there would be more butter in your purse. And can I ask what you do with your checkbook? Ummm, I think I've been living under a rock because I didn't realize there was a such thing as blonde bobby pins. This just made my day!!! What Does Friday Even Mean Anymore?